I have known Jacques Vesery for many years now and I can assure you that you will never meet a more humble artist. 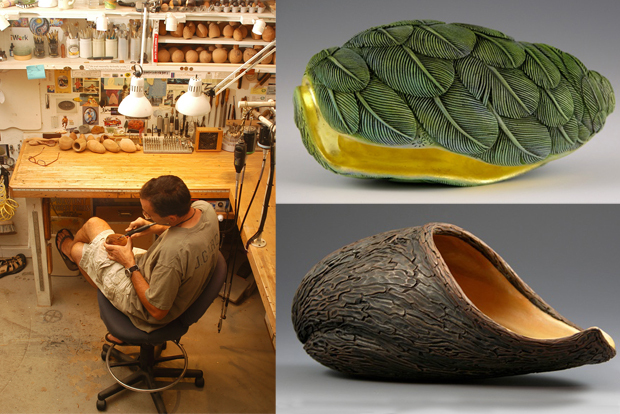 Jacques Vesery is an Artist/ Sculptor/woodturner from Damariscotta, Maine. He is always striving to create an illusion of reality. His vision and inspiration begins with repetitive patterns derived from the ‘golden mean’ or ‘divine proportions’. The marriage of pattern, form and proportion conveys a sense of growth from within each of his pieces. He is greatly influenced by the source of his medium the living tree and the great circle which is life. The colors and natural textures reflect the past and present, growth and history, which is a circle. They close the gap, coming around full circle, forming a balance for him which cannot be found in squares. After serving as a submariner in the Navy, Jack became a scrimshander in Hawaii and later, Cape Cod. He then served as a forest ranger and fire warden in northern New Jersey. A self-taught artist, Jack now works in wood, a more substantial and environmentally sound medium. Jacques has lectured on design and concepts within his work in France, Italy, England, Canada, New Zealand, Australia and 28 US states at such locations as Journees Mondiales du Tournage D’art Sur Bois Congres, Loughborough University, Anderson Ranch, `Aha Hana Lima- Hawaii and Haystack Mt. School. He has been included in over 20 publications and will have work in ”100 Artists of New England” to be released in the spring of 2011. Other books include ‘Scratching the Surface’, ‘Wood Art Today’, ‘Natured Transformed’ and ‘New Masters of Woodturning’.